Use your wit and tactics to overcome the obstacles and save the gorgeous Green Planet! Collect energy crystal to build your army of robots and fight to rescue your friends. Beware! The enemies are everywhere; on the ground, in the sky, over the sea and even under there! 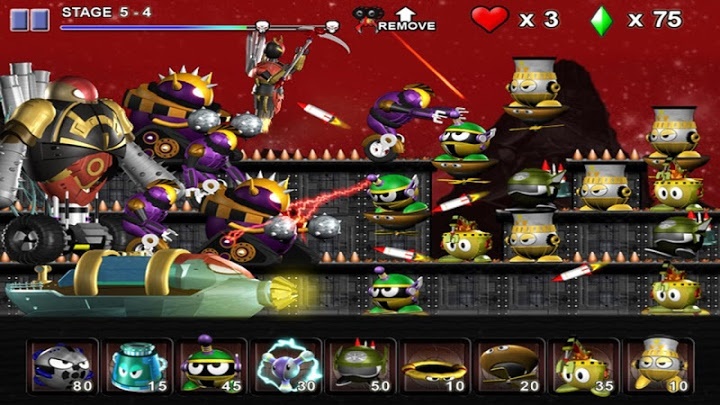 Tiny Defense features bright cartoony graphics with funny characters, easy-to-learn gameplay with a good depth to please strategy fans, a vast number of levels and mini-games with the challenging boss fight. Stand united and prove that size doesn’t matter in Tiny Defense, a playful challenge for strategy game lovers! *** TIPS: Story Mode continues after the first 50 levels 2 times! Extend the fun to the total of 150 levels!